vCenter Server Database Monitoring captures metrics that enable the administrator to assess the status and health of the database server. Enabling Database Monitoring helps the administrator prevent vCenter downtime because of a lack of resources for the database server. Database Monitoring for vCenter Server enables administrators to monitor the database server CPU, memory, I/O, data storage, and other environment factors for stress conditions. Statistics are stored in the vCenter Server Profile Logs. 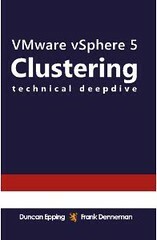 You can enable Database Monitoring for a user before or after you install vCenter Server. You can also perform this procedure while vCenter Server is running. One thing that I noticed is that these metrics were being collected in the vCenter log files prior to running the enabling script. I’m not sure if this is because vCenter already had the required permissions to the master database (I use SQL authentication and I didn’t explicitly grant this), or perhaps this is enabled by default in the vCenter installation routine when the database prepare script runs. The instructions provide plenty of context but are are fairly brief and don’t identify next steps or how to harvest the collected metrics. Perhaps the vCenter Service Health agent monitors the profile log and will alarm through vCenter. If not, then I view this as a monitoring framework VMware provides which can tailored for specific environments. Thresholds could be defined which trigger alerts proactively before dangers or an outage occurs. Admittedly I’m not a DBA. With what’s provided, I’m not sure if this provides much value above and beyond native monitoring and alerting provided by SQL Server and Perfmon. 1) Identify the root cause of the problem. 3) Identify the unique tasks or chain of events which lead to the problem. I asked if the ESXi cluster and vCenter were licensed. Carl confirmed by showing me that vCenter was licensed with Standard Edition and the hosts which wouldn’t power on the VM were still using 60 day Evaluation licensing as they were just recently built. I further verified the Evaluation licensing had not yet expired. 1) Identify the root cause of Carl’s vSphere problem. 2) Identify the solution for Carl. 3) Identify the tasks or chain of events which lead to Carl’s problem. If you think you know the answer, write it on the top of a shrink wrapped pallet containing a Cisco UCS 5100 Series Blade Server Chassis, fully loaded with UCS B200 M2 Blade Servers each with 192GB RAM, UCS 6100 Series Fabric Interconnects, and a pair of Cisco Nexus 5548P next generation 10GbE switches and send to my mailing address. Or… reply in the comments section below. The first correct and complete answer (I hope there is just one) will receive internet recognition, real life respect, and if I can find one, a prize. No promises on that last one but I’ll see what I can do. 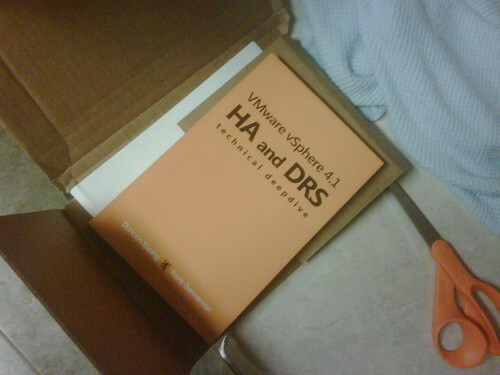 A few months ago, I wrote about the arrival of the new VMware vSphere 4.1 HA and DRS technical deepdive book. Having finished reading the book, I thought I’d write a quick follow up. This book was a pretty easy read, and by that I mean it as a compliment in that the authors did a superb job in conveying the details of deep technical discussions in a way that I think is easy to comprehend and understand at different levels. At the same time, the coverage did not disappoint. All aspects of HA, DRS, and even DPM were discussed at length. Along the way, Basic Design Principles in each section were highlighted to summarize the technical detail. Duncan and Frank cover not only the supported parameters, but the unsupported and sometimes undocumented tweaks as well. Most important, they are very clear in pointing out what’s supported by VMware and what’s not. I feel that I have a pretty good handle on HA and DRS but that doesn’t mean that time spent reading this book was wasted. I picked up some design bits that I hadn’t thought about before having not been exposed to the environments in which they would apply. Some sources do a fine job in discussion either HA or DRS, but what sets this book apart is that it expands into how the two operate together which is just about as important to understand as the individual topics themselves. The DRS and DPM chapters exposed the computational math behind the decisions which DRS makes. Quite honestly, I probably learned the most here. Not that I’ll be able to keep the formulas in memory for very long, nonetheless the content and the size of the book will make it a great reference. Capping the end of a great book I was pleasantly surprised to find an Appendix containing all of the Basic Design Principles, as well as all of the advanced parameters for HA and DRS. If you’re short on time for reading, advanced to the 11 page Appendix in the back and you’ll get a pretty good summary of the first 18 chapters. If you buy the book, I hope you enjoy it as much as I did. Thanks Duncan and Frank!